Good to see you on Sat. (briefly). Glad you are getting out with the little one, hearing about it sure brings back a lot of fond memories. Good to see you too, Chris, but wish we would have realized it! Thanks for the kind words, any good advice? BTW, I ran past 2 sets of bighorns, twice, with a digital camera AND a Gopro. I only got some crappy video and pictures. YOU got a fantastic shot on a cell phone! Goes to show how much talent, patience, experience, and a good eye is important in photography! Mike! Hope all is well with you and the family! This is super inspiring, you getting out on the trails with the boy in the BOB. We have some friends who just gave us there Sports Utility and I'm going to have to do my best to convince Elise that using it now with our little girl, she just turned 8 weeks, is going to cause no ill effects! So would you say that using it on the valley trails would be fine? Hi Josh, thanks! Glad to hear you're doing well, are you off Facebook? (Not a bad idea when time is precious). I took Jamison on some of the Valley trails, it wasn't too bumpy but it was frequently narrow, and I worried about getting in the way of mt. bikers, though the one's I saw were chill and often gave us a thumbs-up. In spots where it is bumpy, though, we slow to a walk, especially because the carseat is top-heavy. There's lots of back-and-forth on the internet about what's safe or good for babies, but I went off of some friends' experience and mostly just watching Baby J to see that he's comfortable. You'll be the best judge of how your daughter is doing! Honestly, double-tracks and dirt roads are the most fun, IMHO, since they're wider for us to get through and less worry about blocking other people around blind corners. In FoCO, would think Pineridge, the first part of Coyote Ridge, lower Bobcat Ridge, Arapahoe Bend, Horsetooth service road, Towers -- BUT it is easy to be going faster than the front brake can handle downhills! 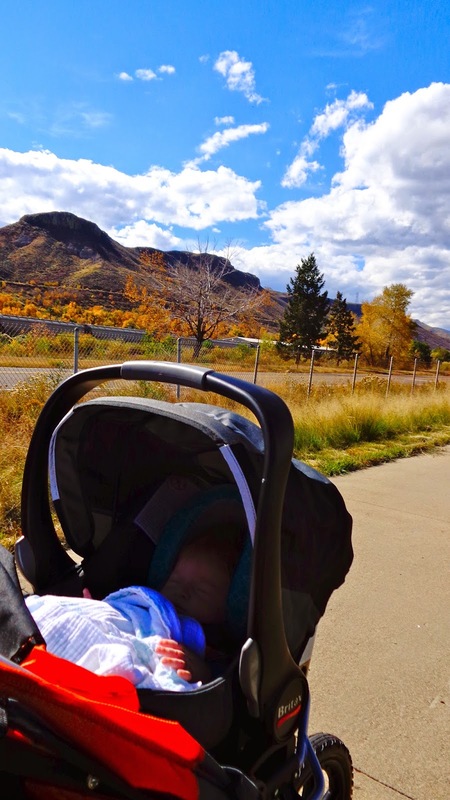 Still, most of our running, then, has been on multi-user paths and gravel next to the pavement -- easy and comfortable to do with that stroller vs. a basic stroller with hard wheels...if I were in FoCo I'd probably go along the edges of Poudre and Spring Creek trails, especially this time of year. Have fun and hope to see and meet you all soon!